Tae Kim's Blog | Umm… Japanese and stuff? So almost 5 years ago, I wrote a blog post about not understanding twitter. Well, I get it now. I also get why Google killed Google Reader. Writing a long, informative blog post is a lot of work and something I obviously haven’t done in a while. There was a golden age where people shared information on platforms with great interoperability and open standards. You could easily aggregate information via RSS/Atom and it was very easy to export, migrate, and generally own your blog data. But controlling and managing your own data is also a lot of work mostly because of the ever increasing onslaught of spam. So it’s easier to give all our data to facebook and google for free while they try to sell us to advertisers. You can’t consolidate anything from facebook, google, or twitter because of course they’re competitors and would never share their (ie your) data with each other. You can even’t retrieve all your tweets and instagram tries to block you from downloading YOUR OWN PICTURES albeit with some cheap and simple filter effects. And now I’m considering shutting down the forum. Yes, I’m part of the problem. Apparently, I need to get off my own lawn. Tuttle Publishing sent me 600 Basic Japanese Verbs: The Essential Reference Guide for review so here we go again. The book’s introduction starts by saying, “Fluency in a language cannot be attained without a solid understanding of that language’s verbs and their usages”. According to the book, the introduction is used to “help students learn both the conjugation and the usage of Japanese verbs”. For a fairly short introduction, it does a good job of going over the various verb forms. It tells you how to separate the verb into 3 groups and the conjugation rules for various forms such as the volitional and conditional with plenty of examples. After the short introduction, we go into what makes up the bulk of the book. The rest of the book lists one verb on each page with various conjugations and example sentences. Much like the “Japanese Kanji and Kana” book I reviewed previously, I really don’t understand the purpose of this portion. The rules for verb conjugation are not as complicated as other languages that have a TON of irregular verbs such as Spanish. So really, a simple computer program can do what this book does for any number of verbs not just 600. In fact, there happens to be just such a tool online at WWWJDIC. Just look up a verb in the dictionary and click the [V] link. Not only is it free, it’s far more complete compared to the book and works for almost any verb you’ll ever learn not just 600. Also, this book doesn’t even reach 400 pages including the introduction. I didn’t count each verb to verify but if my math is correct and each verb takes up one page, how in the world does this book have 600 verbs? 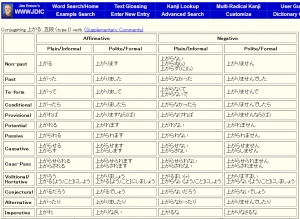 The tool impressively even conjugates obscure exceptions such as 「問う」 and 「請う」 correctly. Neither of these verbs are even in the book. The only verb so far the tool doesn’t conjugate is 「ある」 because the negative for 「ある」 is an exception to the regular conjugation rule. This brings me to the core flaw in this book. While the first 28 pages describing various conjugations are informative, it is far from comprehensive. It doesn’t cover tricky conjugations such as 「なさそう」 and it doesn’t highlight important exceptions such as the negative form of 「ある」. It also completely ignores the fact that Japanese is unique in that while the state-of-being is not technically a verb; nouns and adjectives are conjugated just like verbs to express state of being. You are missing a huge chunk of Japanese grammar if you don’t cover state-of-being. In fact, it doesn’t even cover the conjugation rules for the negative, past, or negative-past for any verb. Instead, it only describes a slight change for negative of verbs that end in “u” without actually talking about what the regular rule is. I’ve looked and I can’t find it anywhere. The book’s introduction is not nearly enough to fully teach you how to conjugate any verb. I get the sense that it only tries to give you a rough idea of how to conjugate and instead expects you to use the rest of the book to look up each individual verb as you encounter them. This approach might work fine for some languages that have tons of irregular verb conjugations such as Spanish but is ill-suited for Japanese. It would have been much more effective to fully teach you the regular conjugation rules and highlight the small number of verbs that have exceptions. In other words, the two sections of the book should have been reversed with the verb lists being 28 pages and the rest of the 350 pages devoted to explanations. Otherwise, you’re just looking up the conjugation per each verb when the rules are the same over and over again. Also, it’s hardly likely that the verb you’re looking for will be in this extremely short list of 600 or I’m sorry, ummm… 305? verb list. And then when you hit a crucial verb that have exceptions such as ある, you just have to know to pay attention somehow. Let’s consider these two questions once again for this book. 1) What purpose does it serve? 2) Can something else do it better and/or cheaper? This book’s purpose seems to be for giving you a general idea of verb conjugation. It tries to fill in the holes with a list of individual verb conjugations and plenty of example sentences. While I like that there’s lots of examples, I just don’t agree with this methodology. Let’s say you see a new verb you’re not familiar with. First, you need to look up how to read it using dictionaries NOT in this book. 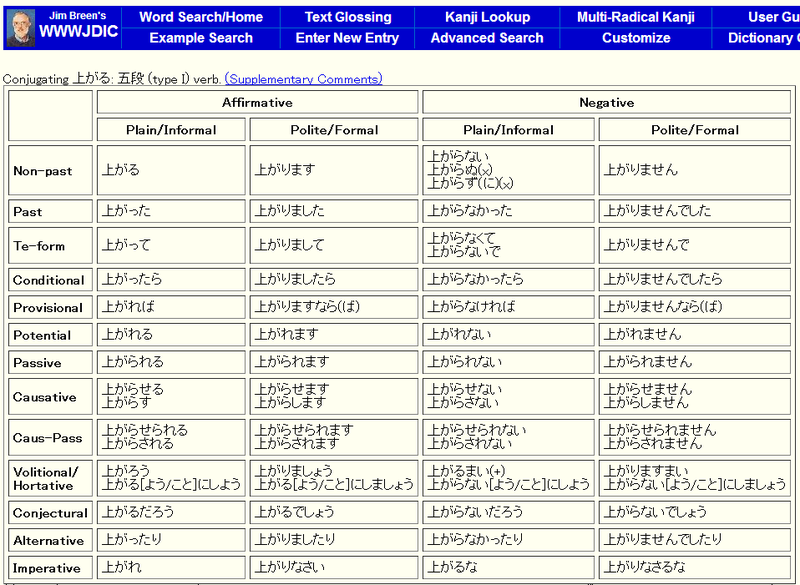 Once you figure out the reading, you need to convert it to romaji to find it in this alphabetized list of verbs. Finally, there are 3 possible outcomes. The first most likely outcome is that the verb won’t be in this short list. The second is that it’s in the book but it follows the same conjugation rules as every other verb in the language. The 3rd is that it’s a verb with a rare exception that you have to notice even though the book doesn’t highlight it at all. Either way, the critical flaw of this book is that it doesn’t really teach you how to conjugate verbs yourself. The book’s introduction describing verb forms should have taken up most of the book with a small list of verbs that highlight important exceptions to take note of. And then perhaps exercises to help you practice conjugation. Now that would be a book I would recommend though there is a free website that already does this (you might have heard of it if you’re reading this blog). As it is, this book lists out conjugations for verb after verb that follow the same rules, something a simple and free computer program can already do online. Unless you can’t use the internet, I would not recommend buying this book. Ironically, most of the introduction, which I see as the only valuable part of this book, is available to preview on Amazon. The rest of the book is not very useful.